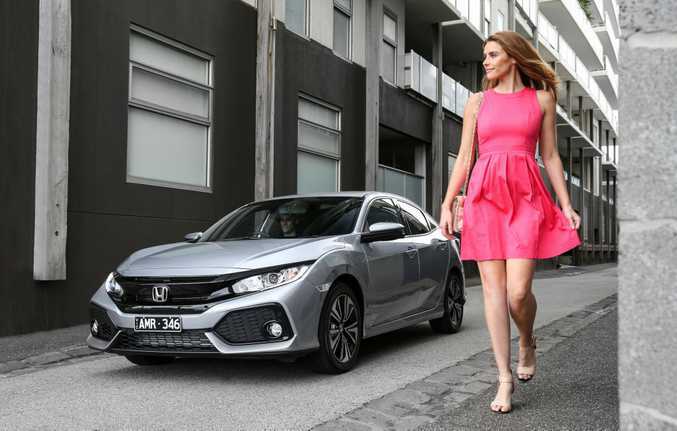 NEW GENERATION: The all-new Honda Civic hatch brings bold styling, the choice of two engines and an impressive drive. LOYALTY is a hard-earned and much-coveted thing in the car game. But it must never be taken for granted, as Honda and its Civic know only too well. 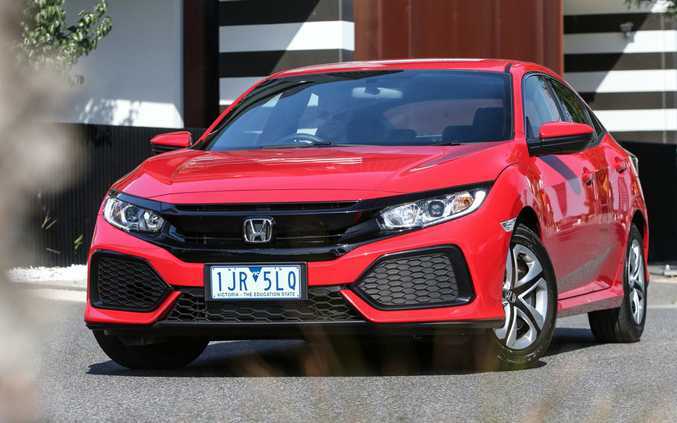 Prior to the 10th-generation Civic sedan launching this time last year, Honda admitted it dropped the ball with the previous model. People weren't buying Civics any more. The opposition had overtaken it with better product and Civic loyalty, if you will, was being severely tested. Then a return to form. Last May the all-new Civic sedan arrived and it was night-and-day better. Brave styling, brilliant chassis and a classy cabin. And it worked. We've been buying them in their thousands ever since. Now it's time to push on for the bonus point. 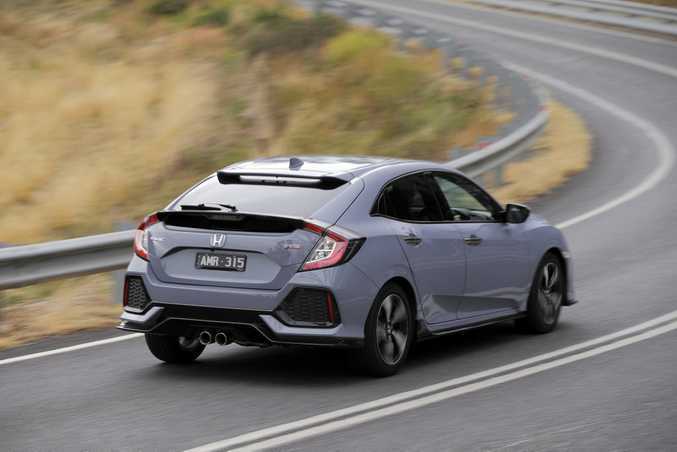 The more practical and arguably better-looking Civic hatch has just gone on sale; near identical in specification and price to its four-door cousin and ready to help Honda sell 7000 more cars in Australia than last year, as is its plan. And it wants to bag the younger buyers. An "exciting hatch" that "expresses youthfulness and progressiveness", Civic Hatch chief engineer Funakoshi-san explained. 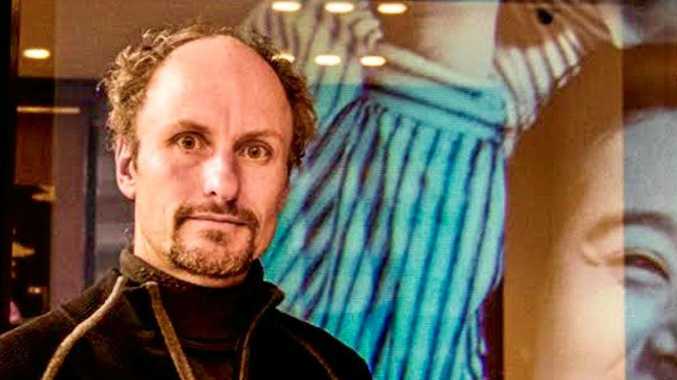 Young folk have four key motivations, we were told - cost of ownership, style, performance and connectivity. The new Civic hatch scores well in each while not being class-leading in any but really, as an all-round package, the little Honda's appeal is obvious. There are five Civic hatches to choose from, two different petrol engines (a 1.8-litre or turbo 1.5-litre) and one transmission - a CVT auto. Driver purists look away, there's no manual or conventional auto choice. 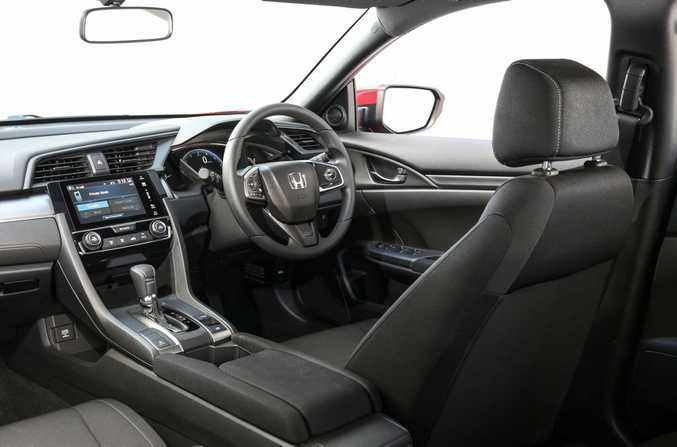 A decent cabin is offered no matter your grade choice - owners of older Civics will delight in the improvements here, with soft plastics for your key touch points, a classy angled central touch screen and clear digital instrumentation behind the steering wheel. 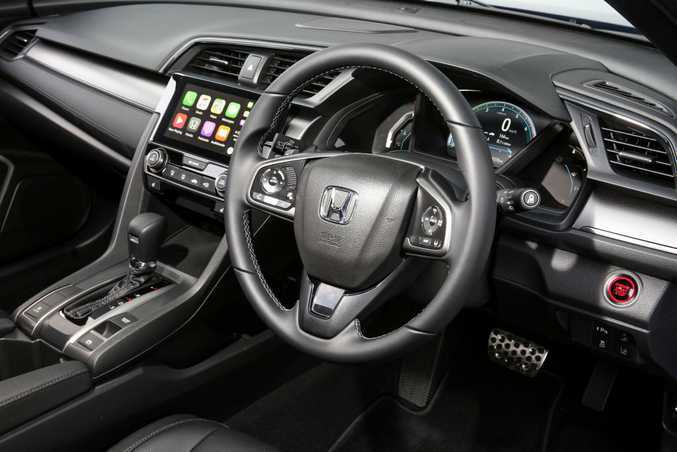 Up front it feels roomy enough and clever touches like a two-tier smartphone tray and deep centre console for iPads (when you remove the cup holders) nods to the connected set ... as do the included Apple CarPlay and Android Auto connectivity. 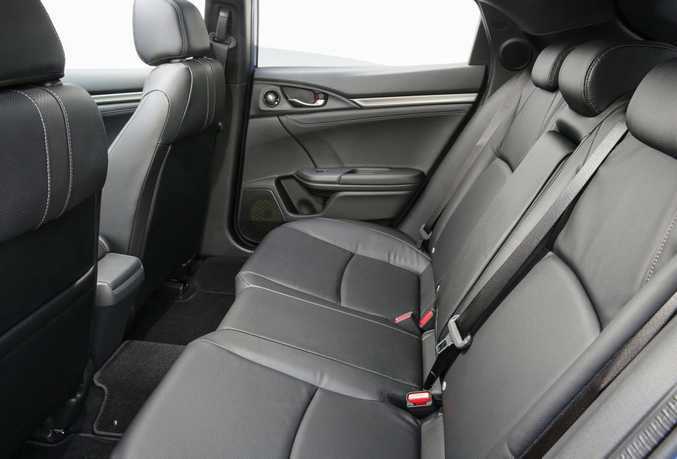 Slimline cloth seats feel hard-wearing, or spend more than $30K for power leather heated chairs in the two top grades and things premium up. 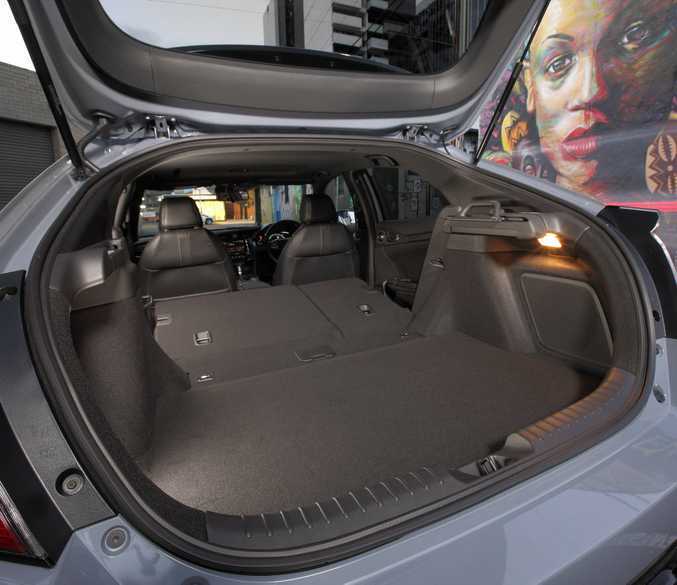 Rear seat space is excellent for the family too, with two adults or three kids accommodated easily. Smooth, refined and easy to drive, the new Civic hatch is an effortlessly capable thing. Both the 1.8-litre and turbo 1.5 are fine choices well suited to the car, but the latter wins on the personality front. Nicely sprung for bump absorption, the Civic shines in town and on the highway and is surprisingly excellent on more testing roads. Its balance, grip (especially on the RS model's stickier tyres) and steering feel make it a bit of a thrill to fling around corners. The "but" is the transmission. The CVT auto sadly dulls the driving enjoyment and it does whine when being pushed. The majority of town-cruising buyers won't mind but the Civic hatch would live up to its sporty intentions with a more conventional gearbox. Impressive specification across the range. The VTi gives a seven-inch screen, reverse camera and cruise control but only steel wheels, while the VTi-S adds alloys, parking sensors, keyless entry and blind-spot monitor. The VTi-L and all above it score the 1.5L turbo engine, paddle shifters, 17-inch alloys and dual-zone climate control; the RS - which really should have some performance enhancements to suit its name - adds sports alloys, central twin exhaust exit, side skirts, heated leather seats and sunroof. You have to go the top dog VTi-LX to get the full Honda Sensing safety suite, giving active cruise control, lane keep and front collision warning. The latter, your autonomous emergency braking, is only available in this grade, which will upset some buyers and our safety advocate ANCAP. Look to the Mazda3 ($20,490), Toyota Corolla ($20,190), Hyundai i30 ($20,950), Kia Cerato ($19,990), Subaru Impreza ($22,600), VW Golf ($22,840) and Holden Astra ($21,990). 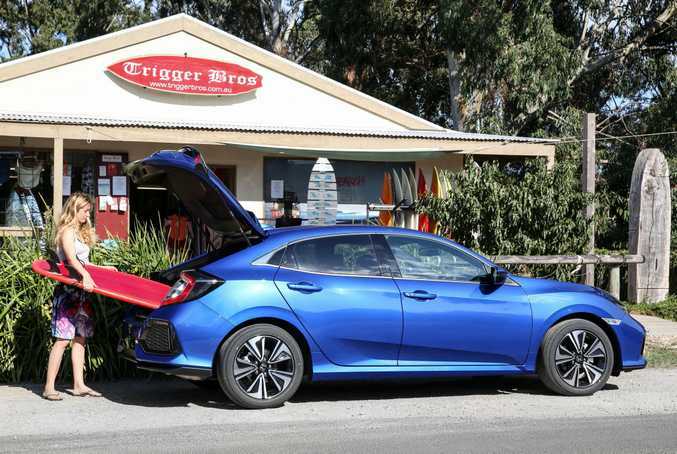 Boot space is excellent - the Civic's 414 litres trumping the Hyundai i30 and VW Golf and smashing the Mazda3 and Toyota Corolla. Striking, bold and sharp, the body design is certainly out there. 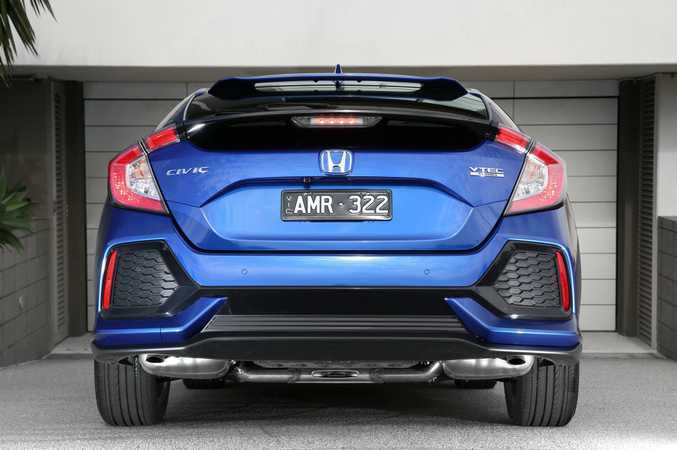 While not pretty, with such busyness it will appeal to those who eschew the vanilla and the hatch design is no doubt sportier than the Civic sedan offering. Well-engineered and easy to live with, the Civic hatch is a mighty leap over its predecessor. 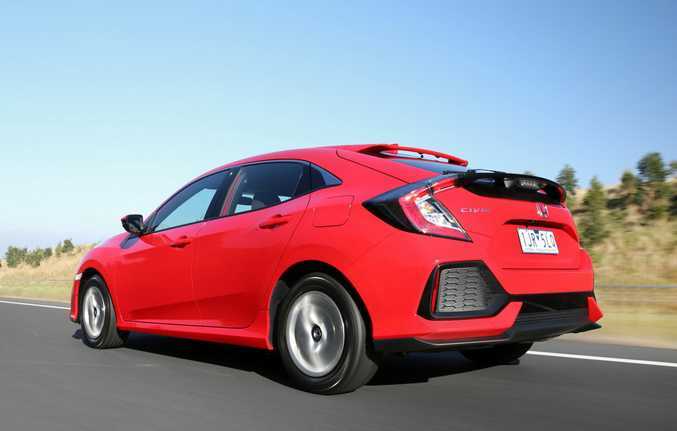 The CVT gearbox takes some joy from an otherwise excellent driving experience, but Honda has every right to expect its new Civic to take a healthy bite of the small hatch market. Model: Honda Civic Hatch VTi, VTi-S, VTi-L, RS and VTi-LX. Details: Five-door front-wheel drive small hatchback. Engines: 1.8-litre four-cylinder petrol with 104kW/174Nm (VTi and VTi-S); 1.5-litre four-cylinder turbocharged petrol with 127kW/220Nm (VTi-L, RS and VTi-LX). Transmission: CVT automatic (paddle shifters on 1.5-litre turbo models). Consumption: 6.4-litres/100km (1.8-litre engine); 6.1-litres/100km (1.5-litre turbo engine). Bottom line plus on-roads: $22,390 (VTi); $24,490 (VTi-S); $27,790 (VTi-L); $32,290 (RS); $33,590 (VTi-LX). The good: Comfortable and assured drive thanks to a great chassis, simple and unfussy cabin with nice LCD driver interface, overall build quality, big and practical hatch boot, eager 1.5L-turbo engine. The not so good: CVT auto transmission robs you of some driver enjoyment, no manual transmission option, no autonomous emergency braking (not optional either) except in the top grade, RS model needs more performance, body styling not to all tastes. Warranty and servicing: 3 year/ 100,000km. Service intervals are every 10,000km or 12 months, services cost $843 over three years.